A Spring Break that is! Have a blast! Thanks for all that you do. Really, I appreciate each and every one of you! Hope you enjoy this little bit of humor. The Dog Ate My Homework. This had the cutest song (sorry if you missed it)! Have an awesome break everyone! Love that song Pink Biz. How cute. Thanks so much for this! One more day! I will be going to the movies today for a Field Trip to watch Horton Hears a Who! I need to get this song and play it during morning announcements-lol! You are great! So glad you liked the song and wanted to re-visit to listen. Feel free, it will be up for the duration of the week. Thanks for your most generous surprise! You are absolutely wonderful! You always put a smile on my face!! You are a dear one!! I will be adding this to the awards tribute page for sure! Thank you so much! Have a really great break! I absolutely adore Shakspere, always have. I own two large hardbound 11 x 14 volumes of his complete works. Entire plays and histories contained within the volumes. Which ironically were published in London, and brought from overseas by my father’s business partner some years ago. They are quite lovely and quite heavy! English Lit, a favorite of mine! Thank you for being a teacher! I praise and applaud your work! Sorry to be so long in responding here. I was ill and then two of my daughters. Thank you for sharing your past teaching experience. I love knowing that! I love that picture – is it stock photography or one you took yourself? Hi, from a Google search, it was one of three pictures that came up as I recall. Those lead to pages of other pics. Oh thanks for that Pink Biz – I’m trying to find some cute dog pics for a collage I’m making for my girlfriend to celebrate her dog having pups – they’re due today or tomorrow!! Yeah, puppies! A collage is such a great gift idea. 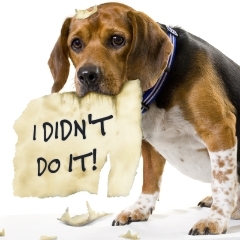 Google “dog ate my homework picture”. Yeah, I seem to remember reading something about MK directors dallying in the import/export business – is that why the practice is now outlawed by MK Corporate? Geez, now I’m getting the feeling that you’re not playing fair. You’re not dancing around the subject matter are you? I like bloggers who get to the point. Have to run now. Tropical Storm Edourdo (sp?) is anticipated to make landfall our direction in the morning. Great conversing again. Take care everyone along the Texas Gulf Coast. God Bless. I’m a man.. I couldn’t possibly dance around anything. Not without falling over anyway! Hope all goes well with the storm. Tell that to Indianapolis 500 champion Hélio Castroneves or Olympian Apolo Anton Ohno. Of course it helped to have partner Julianne Hough to win Dancing with the Stars (what a cutie and great dancer). Speaking of dancing around, TS Edouard (correct sp) took a little easterly turn overnight and will see the Texas coast a wee bit earlier this morning. Sheltering in for the day if needed. Thanks for the good thought. I just googled Julianne Hough – she looks like a young Heather Locklear in some photos.. very nice!